Limit Mobile Data Usage to avoid extra internet charges. If we talk of United States and India, then Internet Service Providers usually places an upper limit of 3 GB in limited data plan and an upper limit of 5 GB, even when they say they are giving you an unlimited data package. And after that service provider will start charging you. 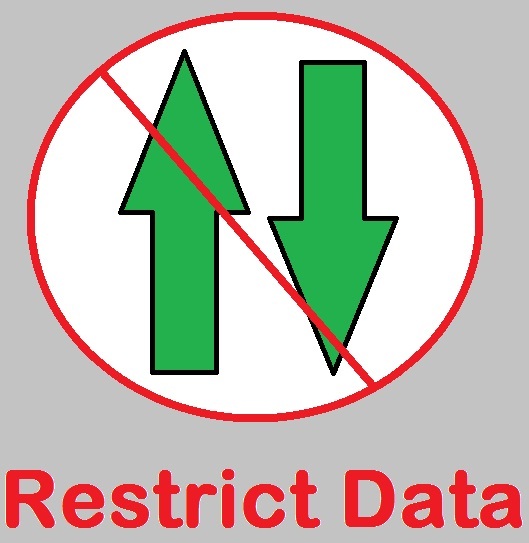 So due to limited data availability in our data packs, it has become mandatory for us to use each bit of our data effectively and efficiently in order to serve our purpose. For using your data packs in an effective way, you should at least have a rough idea of what amount of data a particular application is consuming so that you can plan the usage of data pack in that way. For example, 30 minutes YouTube video a day consumes 85-100 MB of data and uploading of High resolution photos can consume around 500 MB of your data in a month. Once you have estimated the amount data to be used per application using any of above estimator then you can implement your plan on your android device. Step 1: Firstly go to Setting option of your android device. Step 2: Then go to Wireless and Network. 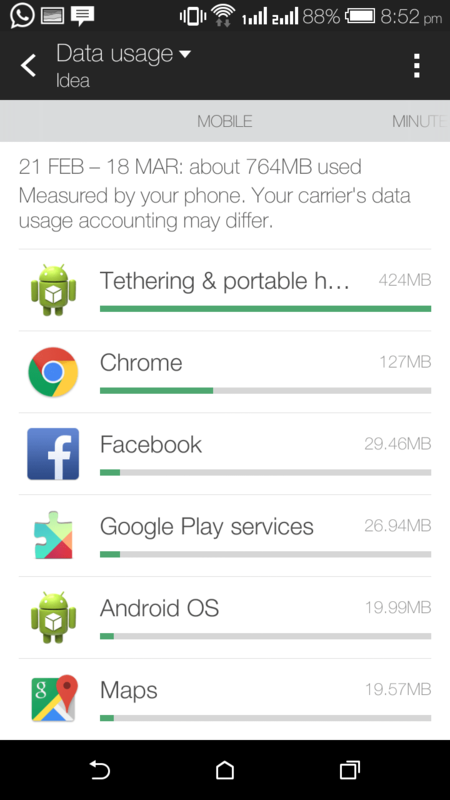 Step 3: Now tap more that contains options like Data Usage, Shared tethering, VPN and so on. Mobile data: Using this option you can turn on and off your data pack. 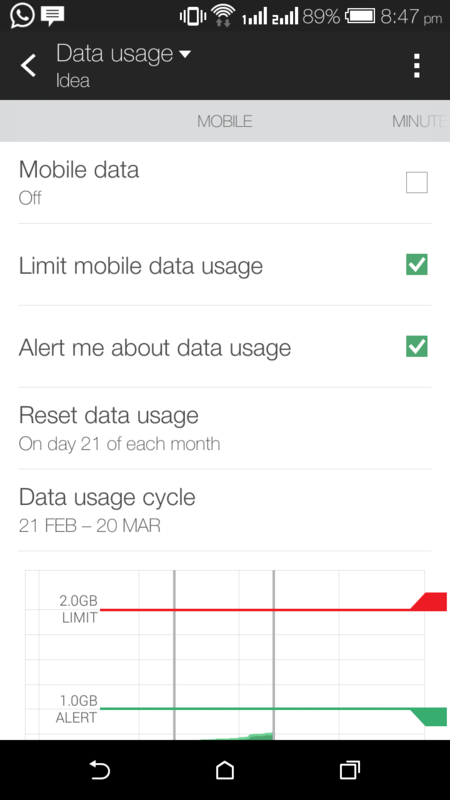 Limit Mobile Data Usage (Shown by Horizontal Red Line): Enabling this option will turn off your data connection when the specified limit is reached. 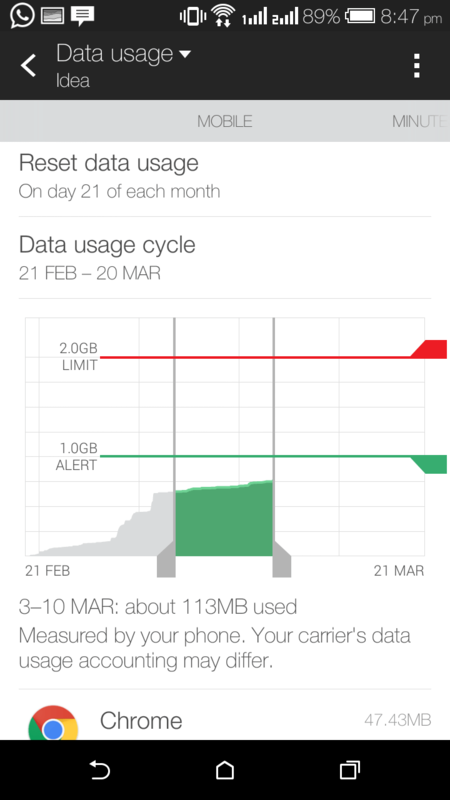 Alert me about data Usage (Shown by Horizontal Green Line): Enabling this option will turn give you an alert when you reach a specified limit. Reset Data Usage: This option enables you to set a particular date on which your data pack will be ended and you will start it all over again. There are many apps that run both in foreground as well as in background and consume lots of our valuable data. 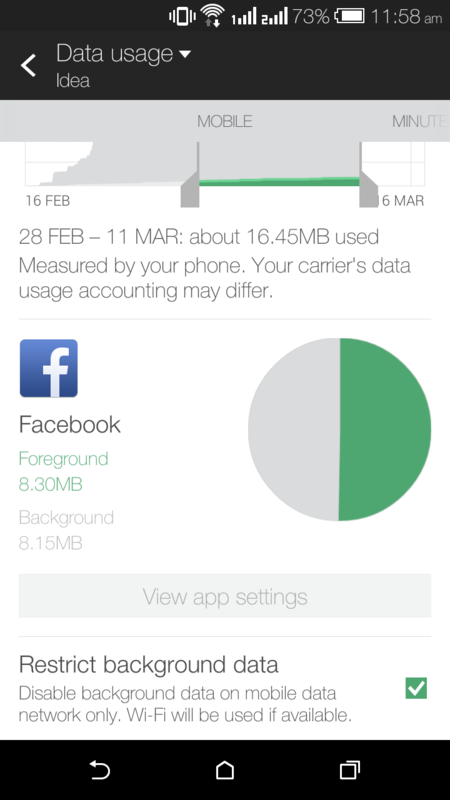 So you can also save your data by restricting the background data usage of the apps. Even by limiting or restricting background data, we can save battery life of android. For that all you need to do is disabling the background data either for a particular app or for all the apps that uses background data. The snapshot above is showing it for face book app. So in this way one can use ones mobile data effectively. If you have any doubts then do comment below.